The NPP plans to hold an emergency national delegates congress next month. This follows a proposal made by its national chairman, Mr Harona Esseku, to the National Executive Council. Sources close to the Party's headquarters told the paper that the emergency congress would find ways of widening the electoral college of the Party across board at all levels. The electoral colleges are expected to include all card-bearing members of the NPP, as well as executives at all levels of the Party together with patrons, funding fathers and Members of Parliament. Reports from the Party's rank-and-file according to sources, indicate that widening the electoral colleges would halt the intimidation, bribery and favouritism that characterised the 2004 primaries. “Party functionaries believe that if the Party succeeds in increasing the number of voters to elect candidates within the Party, it will solve the problem of leaving the election of candidates in the hands of few members at the constituency, regional and national levels,” the sources said. 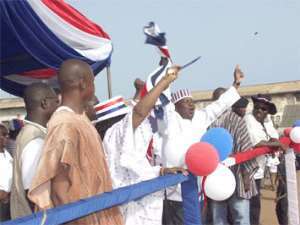 The NPP is also expected to elect officers from the polling stations to the National level. Polling station executive elections is slotted to be held in April, constituency level elections June, regional level elections in August, and the national executive elections in September.